I know that to some people, a flavor like Winter Kiwi is a bit strange, a bit lateral. Fruit and mint isn’t something a lot of people immediately put together, plus the fact that mint is more of a Christmassy kind of flavor. But remember, it IS winter for half of the world. For instance, in New Zealand. Winter Kiwi. Get it? Yeah, it’s not all that clever, but I was inspired to first make it a couple of years ago when I had a few very frequent customers from New Zealand. I wanted to thank them for ordering from my tiny little company halfway around the world, so I dedicated this lip balm to them. It is relevant that, not only is it wintertime for them, but also summertime for me. The scent not only has that wintry-cool mintiness, but also the scent as a whole reminds me of my favorite thing about summer: Ocean City, Maryland. I’ve been to Ocean city at least once virtually every summer of my life, so unsurprisingly it is inextricably linked to summer for me. I love everything about it: the breeze, the heat, the foods, the shopping, and best of all the smells. The ocean, the rain (always lots of rain), Old Bay seasoning, and the smell of walking into a Candy Kitchen. Imagine walking in from the blistering heat to an air-conditioned candy-coated world of fudge, salt water taffy, and a million types of fruity candies. 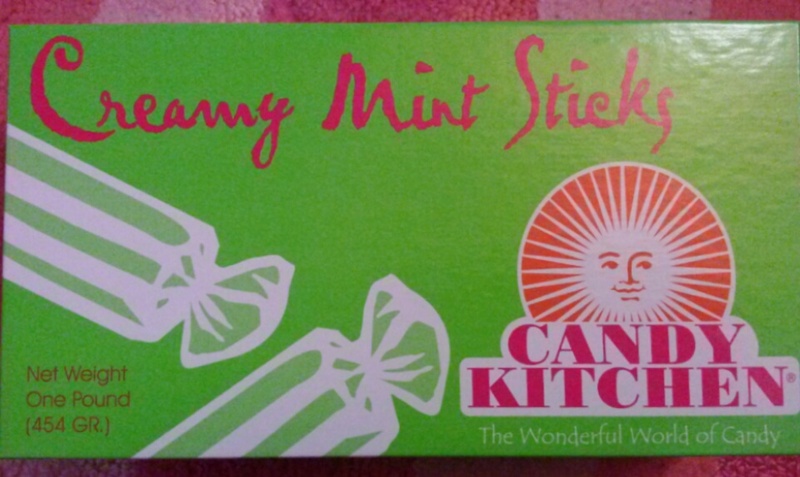 That’s Candy Kitchen. There seems to be a Candy Kitchen on just about every block in Ocean City. My favorite things to get are the different flavors of “fruit twists” (like Twizzlers but a bigger variety) and Creamy Mint sticks. They’re kind of like those butter mints you sometimes get with your bill in restaurants, but they’re softer and mintier, and best of all, vegan. They come in four different colors but they’re all peppermint (though I think it would be really cool if the different colors were different mints – white peppermint, green spearmint, etc. ), and because they’re sticks, you get a couple of bites out of each one… oh, who am I kidding? I put the whole damn thing in my mouth! So you see, Winter Kiwi is not only my nod to my friends in New Zealand and elsewhere down under, but also a kind of love letter to my summer happy place… in lip balm form. I think anyone who has a similar place with fond memories with enjoy it, and even if you don’t, I think you’ll love the combination. But don’t wait too long; Winter Kiwi Lip Balm is going away with the equinox or thereabouts, with the 23rd as its final day for sale! Next week is autumn (or spring!… alright, that’s enough), and we’re cooling down with another fall treat: Salted Caramel Apple Lip Scrub… and yes, it IS as good as it sounds!